April 12th Christine and me attended the first Joomla!Day in Mashhad, Iran. 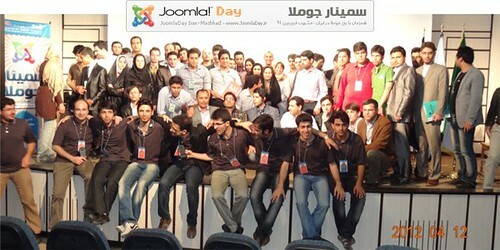 The JoomlaDay team around Saeed worked one year to make this event possible. Due to ongoing sanctions against Iran it was not possible for Open Source Matters to support the event with 500 US$ as they usually do for an official Joomla!Day. I announced the event personally in several chats, meetings and JoomlaDays (last time in New England) but people had concerns about the political situation and often fear to get involved in that. For our company cocoate which is based in France exists regulations too that make it impossible to support the event financially. At the end of the day we decided to have a look by ourselves, fly to Iran and attend the event. First problem was to figure out how to get a visa. For getting a visa you need a confirmation of a hotel reservation with a price in. 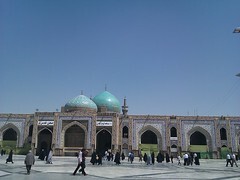 Especially in Mashhad the hotel staff speak Farsi and Arabic but very little English. Confirming a price longer than a few weeks/days is hard for them because of a rising inflation in the last months. At least we found the Bahram Hotel which is located near Iman Reza shrine and near the house where Ali Khamenei سید علی حسینی خامنهای was born. We had to add our names to a list of the German “Auswärtiges Amt” and they told us to be very careful, don’t take personal computers, cameras and other equipment with us and several more security advices. It is not possible to use our credit cards in Iran so we had to bring in cash for the hotel and our expenses. The money has to be changed somewhere (be careful when carrying high amounts of cash in your pocket …). We got more and more unsure whether it was a good idea to go to Iran but the curiosity and the hope that people are nearly the same in the whole world was still bigger. When we arrived at Mashhad Airport (2am) Hamid (JDay Organizer), Reza (International Airport Manager) and his friend Omid welcomed us, helped as to go through the visa procedures (140 Euro “entry fee” for us two Germans :( ) and brought us to our hotel. Christine had to cover herself. At the day of the JoomlaDay we were again accompanied by Reza (the guy from the airport) and his friend Omid. We were told, that it is not allowed to take photos. At the Joomla!Day we met immediately many Joomla people that took photos and soon we met journalists that interviewed us. We talked with so many people and it was so interesting. We attended most of the sessions and people tried to translate the most important parts for us. The event started with a prayer, a video (has anyone the link?) about the Jomladay and the national anthem, followed by a recorded video speech of Ryan Ozimek and Paul Orwig (no photo … sorry Paul :) ). Christine and me presented sessions which were perfectly translated by Mohammad Musavi. For lunch, the whole group (ca 100 people) was invited to a restaurant. We had to go by bus and by car. Everything was very well organized. In the afternoon we continued with sessions and networking and at 8 pm the first JoomlaDay in Iran ended with a group photo. We talked to many people that use Joomla as site builders, developers, designers, web agencies and entrepreneurs. We talked also with interested newbies who wanted to know more about the possibilities of the Joomla! system. The discussions were sometimes very intense and we learned that Iran seems to be a kind of “Joomla addicted” country :) What we learned too is that open source software is not that common, because there is no copyright protection law in Iran and most of the propriety software is available for free. Open source is primarely understood as a source to earn money. The spirit of open source needs a bit more love :). Iran is blocking websites, e.g. Facebook, Twitter, YouTube, Vimeo, Flickr, Google Maps and many other sites. E.g. in the hotel it was not possible for me to establish a SSH connection to our server. At the same time, Iran has 17 million Facebook users and in the last days I saw more and more photos of JoomlaDay Iran from our new friends. People use a software called Anti Filter (tolerated by the government) to access the blocked sites. It even seems to work on mobile phones. The speed of the internet is in general slower and it reminds me to offer a good mobile version of cocoate as soon as possible. The next evening, until 2 o’clock in the morning, we had a long discussion with Saeed and his friend about our thoughts and feelings concerning the first Joomla!Day Iran. We discussed what was good and not so good and how to change that and we born the idea of a Joomla! Roadshow in Iran in preparation for the next Joomla!Day (This is the base of our plan, please have a look and give feedback). So, we will come back and join you for the Roadshow. At the end of this discussion Saeed expressed his wish to translate the Joomla! 2.5 Beginner’s Guide into Farsi and add a few additional chapters to that book! For us it was the most interesting stay since years in another country and we will come back for sure! Hopefully for the Joomla! 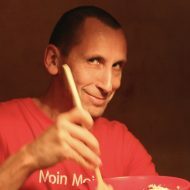 Roadshow and Joomla Day next year! We even managed to buy a wonderful carpet in the old carpet bazar. Concerning the political situation it is hard to say something substantial after being there for 5 days in just one city. Beside the JoomlaDay we talked to many people like the guy in the bazar who earns his money as a whole seller for chinese jewelry that he imports himself, the guy that joined us for lunch, the staff from international airport Mashhad, the volunteers in the holy shrine, the covered ladies in the exchange office, a man with a lot of scars from the Iran/Irak war who was happy to talk to us in French, the guy who was concerned about an upcoming war against Iran, the cheese dealer who taught me how to use the old calculator that his father is still using, the shop owners where we bought the tschador and other stuff, the friendly women that helps Christine to wear the tschador in a proper way and uncountable more friendly people we talked too. Each of the stories we heard would be worth to write more about. Just remember that all these people live the same normal life as you do when you hear about the evil Iranian empire in the news! Joomla! brought us together and that is such a strength of this project!